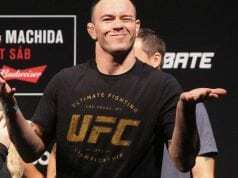 Tyron Woodley explains why he doesn’t think that former interim welterweight champion Colby Covington should get the next crack at the strap. It’s well known that Covington was supposed to be the next in line for Woodley and the title but Covington underwent surgery to correct a nasal issue and turned down the fight. Thus, the UFC gave the title shot to rising prospect Darren Till. As seen in the main event of the UFC 228 pay-per-view event on Saturday, September 8, 2018 in Dallas, Texas at the American Airlines Center, Woodley was able to score a second round submission victory over Till to retain his title. Following the fight, Covington called out Woodley for a fight with the welterweight title on the line. However, Woodley made it known that he’s not thrilled to fight Covington in his next title defense. But he also didn’t say Covington was out of the question. 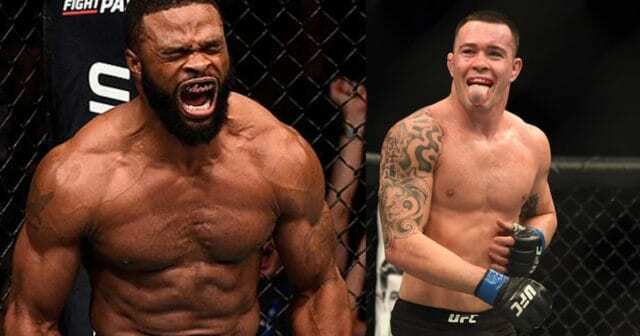 Now, Woodley is looking for a quick turnaround and noted that UFC 230 is a potential return date for him as the UFC doesn’t have a main event for that show. “I’m not saying I am gonna fight him, because I don’t feel like he deserves my platform right now,” Woodley said. “He had his chance to be here. He bitched out, if you want to be honest and frank. He talked all this crap and when he got in the hot seat, the second he won that belt. I said, ‘Let’s come get this smoke.’ He got quiet. Instagram accounts got taken down for a brief moment and he didn’t say nothing. The UFC 230 pay-per-view event is set to take place on Saturday, November 3, 2018 at Madison Square Garden in Manhattan, New York City with the main card airing on pay-per-view at 10 p.m. ET while the preliminary card will air on FOX Sports 1 at 8 p.m. ET and the promotion’s streaming service, UFC Fight Pass.